Though I absolutely loved this book and gave it 5 stars, I will never read this freaking novel ever again. EVER. NEVER EVER. Having said that, if you read this book and then tell me that I am seriously messed up for enjoying it, don’t say I didn’t warn you. 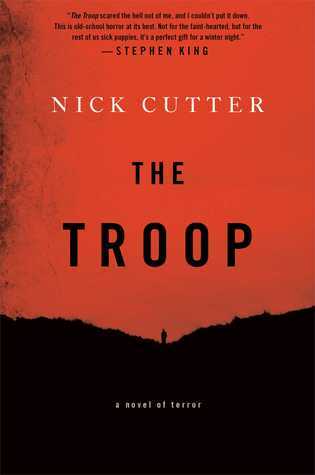 Scoutmaster Tim Riggs takes a small troop of young men out into the Canadian wilderness for a harmless, three-day camping trip; one that is supposed to be filled be bonfires, hotdogs, campfire songs, and the occasional ghost story. When a malnourished and frail looking man to stumbles upon their campsite, begging for sustenance, the troop doesn’t realize what he has brought with him. What he has EXPOSED them to. What starts out as a typical camping trip turns into a story of contamination and survival, but not just against this strange man, but among themselves. But when you are out in the middle of nowhere, who will come to your rescue, and will they get there in time? Look, I am all for being scared like a little girl and am not too easily disgusted by body horror, but The Troop takes the bloody cake. Not only do these boys have to fight through their current predicaments, but each character’s past is brought to the surface to emotionally drag the reader through each individual’s tribulations. This novel is gut-wrenching and gives you more feels than you can handle. You’ll laugh, go to bed with the lights on, cry, and maybe even bathe in Purell. Having said all of that, the writing is absolutely wonderful. Cutter’s use of language is simply one in a million and is the reason why I continued on through the grueling sequences (of which there are MANY). His ability to instantaneously hook me with the characters and create an ever-present sense of dread mixed with a minuscule drop of hope did me in. He pulled no punches in this novel and I highly commend him for that. If you enjoy horror, and I mean REALLY enjoy horror, this is a must-read. If you are grossed out by body/creature horror or the use of violence against animals, then you will need to take heed and skip. Otherwise, I’d love to hear what you think. Cutter just made my list of to-read authors and maybe he will make yours, too. I’ve been hearing positive things about this one and here’s another 5/5 review. It goes on the list. Absolutely :D. Just hope you are ready for an emotionally draining and gore-filled read.